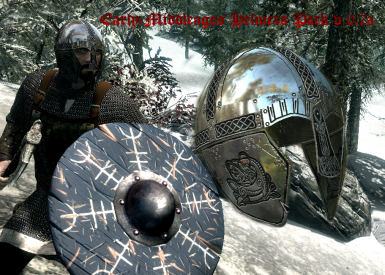 Mr.Dave for his awesome chainmail texture - http://www.nexusmods.com/skyrim/mods/2324/? 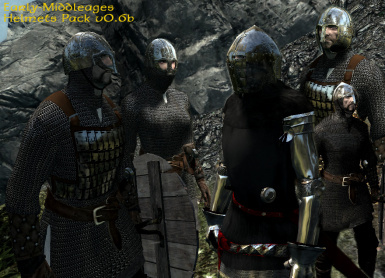 Still WIP so more helmets and bugfixes would appear in some near future. Thx to trold for finding the issue and a solution. 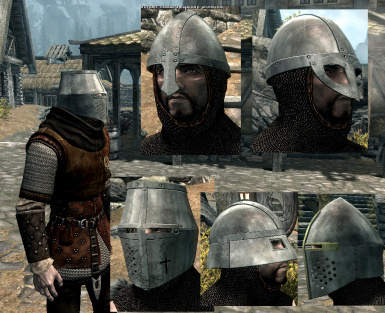 New helmet is crafted under "Steel" section and require 'Advanced Armor' perk. + see version 0.3 crafting section. !!! 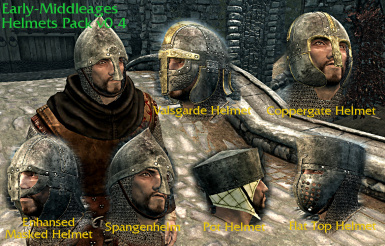 Now all helmets are added to leveled list and may appear on bandits and in some vendors' inventory. 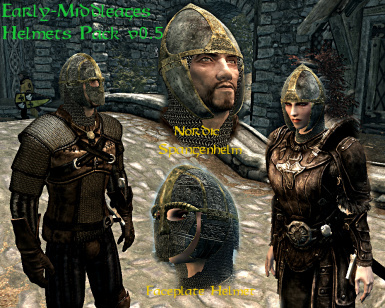 If you have another mod that's changing bandits' helmets list (like Cloaks of Skyrim) make sure to place it before this mod in load order. The same as v 0.6 but with slightly different textures and enviroment reflection setting. All new helmets are crafted under "Steel" section. 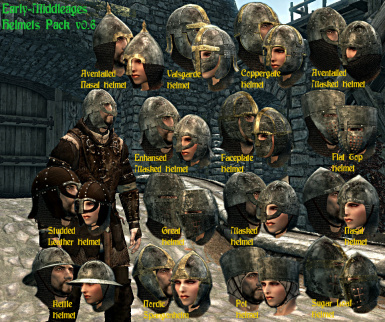 All helmets now have a proper female characters related meshes! 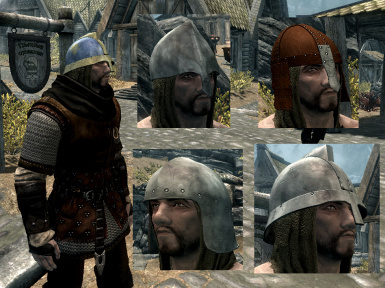 All new helmets are crafted under "Steel" section and require 'Advanced Armor' perk. All new helmets are crafted under "Steel" section. Enhansed Masked, Valsgarde and Flat Top helmets require 'Advanced Armor' perk. Download 0.3 to 0.4 update file only if you have version 0.3 installed. Copy its content to your game data folder with files overwrite selection. !IMPORTANT! 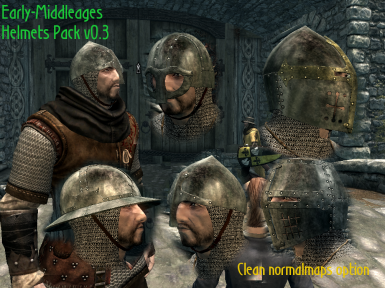 This version doesn't include previous version's helmets, so if you want to use them install previous version separately. All models are completely reworked. Studded Leather Helmet is crafted under 'Studded' section although it requires 'Steel Smithing'. All other under "Steel" section. 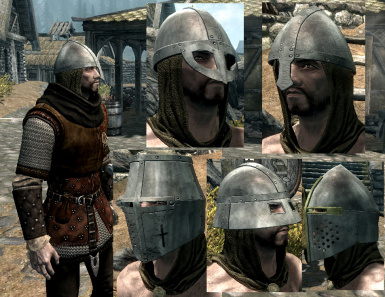 Sugar Loaf and Great Helmets require 'Advanced Armor' perk. 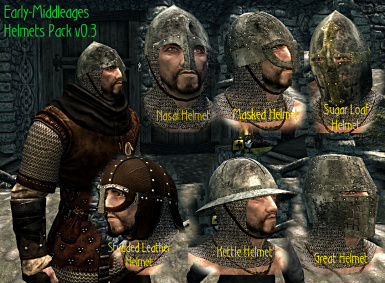 To craft helmets you now also need some amount of 'Rivets' and 'Steel Plates', wich are crafted under 'Miscelaneous' section. 1 steel ingot gives you 2 steel plates or 20 rivets. You need 'Steel Smithig' to craft them.